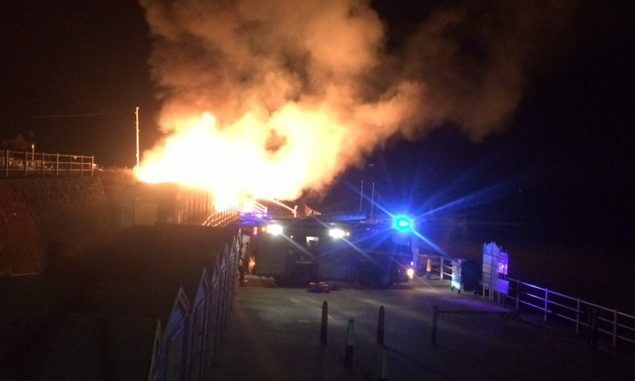 Emergency crews were called to beach huts on fire at Minnis Bay during the early hours of this morning (August 13). Kent Fire and Rescue says five huts were destroyed and another damaged in the blaze which was reported at 00.40am. Four of the destroyed huts are believed to be numbers 17 through to 20. Two fire engines attended the incident in The Parade and crews used a main jet to extinguish the flames. The fire is believed to have started accidentally as a result of a cooker being left on inside one of the beach huts. Crews had made the scene safe by 1.30am. It is the second time huts have been severely damaged at Minnis Bay this year. In April 20 huts suffered roof and structure damage after being battered by storms.